GACA is an informal network of ceramic artists working in the Austin area who are committed to sharing a passion for clay and offering opportunities for professional and artistic development. See Facebook where an event will be posted for each month's artist or activity. See Calendar for details of previous events. 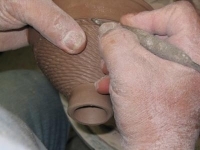 GACA formed in May of 2003 from a group of Central Texas Clay Artists whose common interest is their membership in TCAA. (Texas Clay Arts Association) Prior to becoming GACA, the group had been meeting informally once a month for about a year. The regular meeting place is St Edward’s Univ. clay lab, courtesy of Ceramics Prof. Stan Irvin. 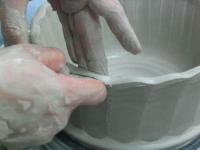 Meetings were focused on sharing information about clay and networking with fellow clay artists. Local artists volunteered their time and talent and did demonstrations, workshops, and slide presentations for the group’s benefit. Because there was no precedent or provision for an active group of members in TCAA, the volunteer board members decided that they could not supervise the activities of local groups of artists. They encouraged the Austin based group to form an identity of their own while maintaining their close ties with TCAA. Thus GACA was born. GACA is a volunteer organization. Decisions are made with direction from the Steering Committee and general consensus of the membership.